So far in 2018 Tibet travel permit regulations have allowed thousands of foreign travelers to explore Tibet. All foreign visitors must have a travel permit before they can enter Tibet. For those planning a trip to Tibet, this can be the most confusing part! Fortunately, a properly registered Tibet travel agency will take care of the legwork required to obtain the permit. 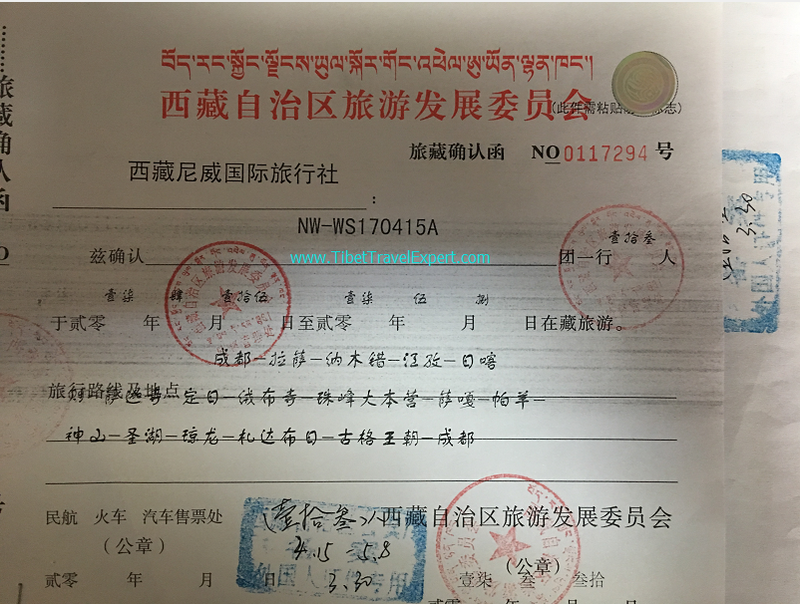 To help travelers plan their tour Lhasa based travel agency Tibet Travel Expert Service-TTES shares the details on Tibet Travel permit 2019. Once travelers book their tour they will need to supply their travel agency with a copy of their passports, Chinese visa pages, and occupation. If these documents are unavailable at the time of booking please be sure to send them along at least two-four weeks before the tour start date. Travelers can think of the travel permit as a kind of Tibet visa. You must present it when boarding the train or checking into flights. For those arriving from Mainland China TTES will mail the permit to the travel group’s hotel. The travel group’s guide will meet those arriving from Nepal at the border or airport and help them through the immigration procedure. We cannot mail the permits to an international address. Groups of any size can obtain a travel permit, including individuals. And currently for travel groups even with members of different nationality they still can enter on the same permit. Certain travelers, such as journalists; foreign diplomats; or military personnel, may need special permission to enter Tibet. TTES will provide details during the tour planning process. From the travelers end, the process for obtaining Tibet travel permits is relatively simple and straightforward. All they need to do is provide us with copies of your passport, Chinese visa, and occupation. If you come from Mainland China, the permit will be delivered to your hotel. If you arrive from Nepal, a guide will assist you. Regulations may change with no notice; TTES will help affected travelers adjust their itineraries. With Spring and summer in Tibet around the time is perfect for a tour of Tibet, travelers are advised to start planning now. Mr. Tony from TTES provided this release about Tibet permits. Tony is a travel writer and is at the beginning stage to build large China and Tibet inbound tourism platform through which any local guides can join the platform, and any travelers can find quality tours around whole China. Stay in touch with Tony’s travel agency in Tibet.